Valid Barry University ID card, or another form of picture identification (ONLY if the ID office is not issuing ID cards at the time of vehicle registration). Students must be registered for the current term and present a hard-copy of their class schedule before they are issued a Barry University Parking Decal. 1.1 Parking on the Barry University Campus is a privilege, not a right, and is available to persons driving on campus solely under the rules and regulations prescribed within. 1.2 The following regulations have been established for facilitating the safe and expeditious flow of vehicular and pedestrian traffic, preventing accidents, protecting University property and informing vehicle operators and pedestrians of traffic laws and safety regulations in effect on the campus of Barry University. Pursuant to future requirements, all changes in traffic rules will be publicized. 1.3 Violators of the traffic rules and regulations are subject to warning, penalties, and appropriate disciplinary and/or administrative action. Motorists may obtain information or assistance from any campus security officer on patrol, or by calling the Barry University Public Safety Department at (305) 899 – 3335 in Landon Student Union, Suite 100. 1.4 BARRY UNIVERSITY ASSUMES NO RESPONSIBILITY FOR THE CARE AND/OR PROTECTION OF ANY VEHICLE, OR ITS CONTENTS, ANY TIME IT IS OPERATED OR PARKED ON ITS CAMPUS, NOR DOES IT HAVE ANY LIABILITY FOR DAMAGE OR THEFT THAT MAY OCCUR WHILE PARKED ON UNIVERSITY PROPERTY. 2.1 The entry, operation, and control of motor vehicles on Barry University property is as authorized and directed by the President of Barry University, who may exercise such controls as deemed necessary. 2.2 The Director of Public Safety, as the President's representative, is responsible for the enforcement of these rules and regulations. 2.3 The Director of Public Safety may exclude or remove from the campus any vehicle that is: used as an instrument in a crime; mechanically unfit; being operated by a person under the influence of intoxicants or drugs; suspected of being stolen; abandoned; not registered with the Public Safety Department; persistently in violation of Barry University parking and/or traffic regulations; or as deemed necessary by the Director of Public Safety in order to maintain law and order on the campus. Thefts or damage should be reported to the University Public Safety Department, Landon Student Union Room 100. 3.1 All vehicles, motorcycles, scooters driven by faculty, staff and students must be registered with the Barry University Public Safety Department. 3.2 All students shall register their motor vehicle within five (5) school days after the beginning of each semester if not already registered. Faculty and staff shall register their motor vehicles within five (5) working days of the date of employment. 3.3 At the time of registration, a valid state vehicle registration must be presented. 3.4 Any person to whom a Barry University Parking Decal has been issued shall be held accountable for all fines associated with the operation of said motor vehicle. In indeterminate cases, an attempt to match the registered owner with a Barry student or employee will be made. Any match of name, address, or other available data will result in that student or employee being billed. In cases where no match can be found, the person in whose name the vehicle is registered with the appropriate State Bureau of Motor Vehicles, may be held responsible for any actions resulting from the operation of said motor vehicle. 3.5 It shall be the responsibility of the owner/operator to remove the Barry University Parking Decal when: a) the status of the student or employee changes; b) the ownership of the motor vehicle is transferred; or c) such person has been denied the privilege of operating a motor vehicle on campus. 3.6 There is no charge for the Barry University Parking Decal. 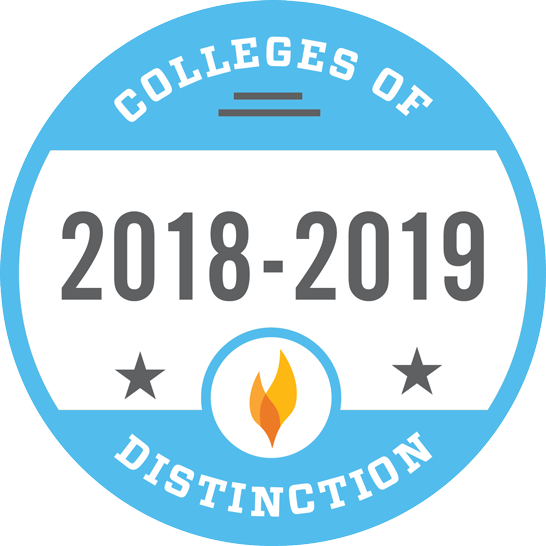 All faculty/staff and registered students may obtain a decal for FREE. 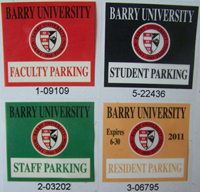 3.7 Barry University Parking Decals are not transferable and must be used by the person and on the vehicle in which they're registered. 3.8 Barry University Parking Decals must be affixed to the front windshield driver side bottom. All University Parking Decals must be clearly visible at all times. If this is not possible, other arrangements must be made with an authorized Public Safety official in Landon Student Union, Suite 100. 3.9 Barry University Parking Decals, which are taped, will not be considered to be permanently affixed. 3.10 Failure to properly display Barry University Parking Decals as provided herein shall constitute failure to register a motor vehicle. 3.11.1 Short term use of a vehicle, including rental vehicles. 3.11.2 Short term parking in a restricted or reserved zone for purposes of loading and unloading. 3.11.4 Other short-term parking as authorized by the Director of Public Safety or his representative. 3.12.1 In lieu of the proper vehicle registration. 3.12.2 For a second unregistered vehicle operated or parked on campus on a frequent basis. 3.12.3 For any reason which would circumvent the requirements or intent of Barry University Parking and Traffic Regulations. 3.13 The Public Safety Department reserves the right to refuse to issue a decal to any person. Should this occur, said person will not be permitted to operate a motor vehicle on the campus. 4.1 Parking on the main campus is restricted to Barry University faculty, staff, resident students, registered carpool vehicles, and registered guests. All others must park in the parking lot west of Miami Avenue, the Tennis Court Lot, or Andreas Park (115th Street and NW 2nd Avenue), the commuter overflow lot. For your convenience, the Shuttle Buc van runs continuously, 8am – midnight (Monday – Friday), to/from Andreas Park (115th Street and NW 2nd Avenue), the commuter overflow lot, and Broad Auditorium. 4.2 Unauthorized parking on the University Mall is prohibited at all times. 4.3 Parking is prohibited in driveways, on sidewalks, on grass (except in areas specifically designated as parking areas), against curbs, in loading zones, along service roads, or in restricted or otherwise reserved areas. 4.4 Vehicles will not double park or take the space of more than one car. 4.5 Parking is prohibited in fire lanes or within fifteen (15) feet of a fire hydrant. All roadways directly in front of any entrance to a building shall be considered a fire lane. 4.6 Inability to locate a legal parking space is not justification for improper parking and shall not be allowed as a mitigating circumstance in an appeal. 4.7 Any vehicle left unattended will be considered parked. 4.8 Students, Faculty, or Staff shall not park in spaces specifically marked for visitors. 4.9 The University reserves the right to remove any vehicle violating campus parking, traffic, or fire regulations, or if it creates a safety hazard. 4.10 Vehicles left on the campus parked and unused for three (3) or more consecutive days shall be considered abandoned and will be towed away at the owner's expense. Vehicles of resident students that are properly registered are not included. Persons wishing to leave a vehicle on campus for extended periods or during breaks between terms must request permission to do so from the Public Safety Office. 5.1 The traffic rules, regulations, and signs governing the use of motor vehicles are in effect twenty-four (24) hours a day. 5.2 Motorists must give the right-of-way to pedestrians. 5.3 Maximum speed limit on campus is fifteen (15) miles per hour. 5.4 All campus traffic is one-way. Please keep to the right. 5.5 Motorists must obey all signs, indicators, markers and signals for the control, direction, parking and general regulation of traffic and vehicles on the campus, including lawful hand, voice, whistle, or other commands or signals of Barry University Security Officers. 5.6 Any person who is involved in a motor vehicle accident resulting in property damage or personal injury shall report such accident to the Barry University Public Safety Department, in addition with complying with the State of Florida requirements regarding the report of vehicular accidents. 5.7 Unnecessary noise from horns or mufflers or any other noise-making device is prohibited at all times. 5.8 Motorcycles, mopeds, and motor scooters must be operated only on streets designated for normal motor vehicle use. 5.9 Vehicular traffic is not permitted on the Mall at any time except as authorized by the Director of Public Safety or his representative. 6.2 If any vehicle on campus is in violation of any regulations, the person in whose name the vehicle is registered will be held responsible for the violation. In indeterminate cases, an attempt to match the registered owner with a Barry student or employee will be made. Any match of name, address, or other available data will result in that student or employee being billed. In cases where no match can be found, the person in whose name the vehicle is registered with the appropriate State Bureau of Motor Vehicles, may be held responsible for any actions resulting from the operation of said motor vehicle. may be subject to having said motor vehicle immobilized until the reason for immobilization has been resolved. 6.4 In cases where a vehicle license plate must be run to determine ownership, a $25.00 administrative fee will be assessed. 6.5 Repeat offenders can be referred to the appropriate administrative officer for further disciplinary action. 6.6 The Public Safety Department will conduct unannounced "Selective Enforcement" programs throughout the academic year. Selective Enforcement programs are used for random enforcement of directional and regulatory signs, and vehicle registration. Be sure to write your employee ID number or student identification number along with the citation number on your check. 8.1 Any person found in violation of Barry University Parking and Traffic Regulations, and consequently cited, shall have an opportunity to appeal such citation to the Barry University Traffic Appeals Board. 8.2 Appeals may be made on the grounds that the facts cited in the citation are in error, that the citation was issued in error, or that there were mitigating circumstances which may excuse the violation. 8.3 Appeals must be made within ten (10) working days of the date of issue of the citation. Appeal request forms are available in the Public Safety Office, Landon Student Union Room 100. 9.1 Barry University faculty, staff, and students are expected to be familiar with and abide by Barry University traffic and parking regulations. It is also the responsibility of the campus member to inform their guests and visitors of the Barry University parking and traffic rules. 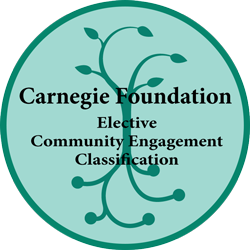 9.2 The fact that a student or employee does not receive a citation for the violation of any regulation does not imply that the regulation is no longer in effect. 9.3 It shall be the responsibility of the motor vehicle operator to obtain knowledge of all rules and regulations in effect on the campus. 9.4 Although it is not required to register bicycles, they may be registered for identification and security reasons at no charge. Parking meters have been added to the visitor parking lot at the NE 2 Avenue entrance to provide short term parking for visitors to the Registrar, Admissions, Financial Aid, etc. Meters have also been added to the visitor parking lot at the Landon Student Union, to provide short-term parking for those who have business to conduct inside that building. The fee is 75 cents for a one hour time limit. Meter violations will result in citations being issued; these will have a $40 fee. 10.1 The appropriate, legal parking spaces for Barry University faculty, staff, resident students, commuter students, registered carpool vehicles, and registered guests are outlined in maps which are available in the Public Safety Department’s office in Landon Student Union, Suite 100.